Floral Tributes make thoughtful gifts at this difficult time. 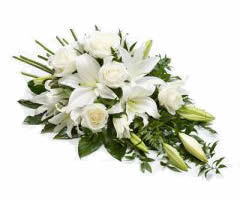 The gentle beauty of flowers can help to express your feelings of respect for the deceased. At Keller’s we have a long standing relationship with our local florist Elizabeth Rose 067 33606 and can guarantee the safe delivery of high quality, fresh flowers on your behalf. Custom-made floral arrangements can be made on request. Music is a personal and integral part of most funeral services whether religious or otherwise. For religious services we can arrange soloists, organists and other musicians as required. Funeral ceremonies in Christian churches will generally be required to only have religious music and hymns during the service. A selection of suggested hymns and psalms for the Catholic Funeral Mass can be given by the celebrant of the service or you can view some suggestions below. Non-religious and civil services can have live performed or pre-recorded music (on CD or electronic format). A committal service in the crematorium (following a religious service in a church) provides a family with the opportunity to play an appropriate piece of non-religious music (on CD or electronic format). Live performances at the crematorium can also be arranged. Pipers or other musicians can also be arranged for the graveside at cemetery burials. This list is intended as a guideline only. There are many other hymns for funerals which are appropriate during a funeral Mass. If you require further assistance please contact us or consult the Organist/Soloist. After the funeral some families wish to provide refreshments for those attending in their own home or a conveniently located venue. These gatherings give those attending the funeral an opportunity to offer their condolences and to share fond memories in more relaxed surroundings. Traditions vary throughout the country regarding such gatherings.